I'm interested in free style and Greco roman wrestling, but I used do it and learn by myself watching relevant stuff on internet, Now I have decided to join a Gym for it and to take it seriously as This book has guided me through the whole process, Now, i come to know with different disciplines of MMa, Like Sambo, Aikido, boxing and muay Thai and all are discussed in details to make it clear for beginners to what to choose. I have made my mind for Boxing and Free style Greeco roman wrestling. 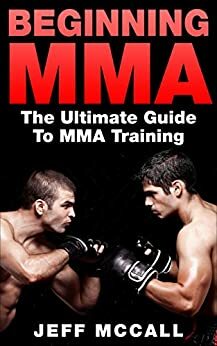 my boyfriend has recently got into the mma training program, and while he is not planning professional performances, I thought this book would be useful for him and I was right! he said the tips about training regimen and gym lingo and weight loss recommendations were more than valuable as they really gave him that insighter's info fighters are usually not so keen sharing. 4.0 out of 5 starsGood beginner's guide to MMA. There was a short history about where and how it started. This book is for beginners who want to learn MMA and take challenges. There were different types of discipline in MMA and it tells you how you should begin. There were details of requirements for a particular style of MMA. I am a big fond of UFC and this book gave me information on how they started their journey. This book also explains some basic requirements and tips to learn MMA which was very interesting. There were no pictures of any postures or moves which make it a bit bored. Though this book is very good who want to be a part of MMA. A Brief History in the world of MMA. Steps to begin, list of the most common fighting styles, the different disciplines. What to expect in your first class. Warm up exercises. These are good resource guidelines. What I do find interesting is a listing of all the different weight classes and their corresponding pounds and kilogram. What I do find interesting is a listing of all the different weight classes and their corresponding weight in pounds and kilogram. Beginner Sparring Tips displayed in this book is very informative. If you want to know more about Mix Martial Arts (MMA) you better try this book as your guide. You will be able to know anything and everything like its rules, the things you must do before you start practicing. This was perfectly written for beginners and definitely recommend to my friends.